The initial note of lavender is succeeded by the modern resoluteness of cinnamon and nutmeg. A warm and milky impression lingers through a base note of sandalwood. Lifted towards new horizons, one discovers little by little the astonishing notes of this mélange. The ambience vaporizer complements your candle and diffusion sticks, delicately perfuming your interior. The dark bottle offers an optimal protection for your perfume against the adverse effects of sunlight, increasing the shelf life and prolonging its effectiveness. The number of times you press on the vaporizer spray will depend on the size of the room and the intensity of fragrance desired. You can vaporize your curtains, carpets, and blankets while avoiding fragile and delicate surfaces. 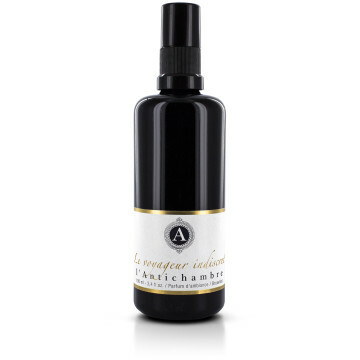 Perfume diluted in organic alcohol and is phthalate-free.